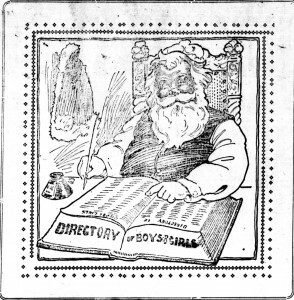 The South Georgia Historic Newspapers Archive is now compatible with all current browsers and provides access to seventeen newspaper titles published in ten cities from 1845 to 1922 without the use of plug-ins or additional software downloads. 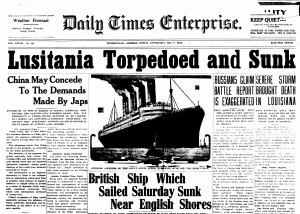 Consisting of over 148,000 newspaper pages, the website provides historical images that are both full-text searchable and can be browsed by date. 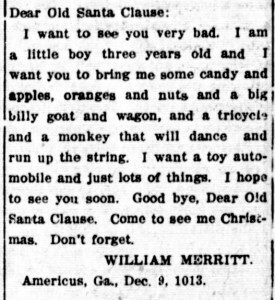 The archive includes the following South Georgia newspaper titles: Albany Herald (1892-1893, 1900-1901, 1906), Albany News (1867-1892), Albany Patriot (1845-1866), Americus Times Recorder (1881-1921), Bainbridge Democrat (1872-1909), Bainbridge Search Light/Post-Search Light (1901-1922), Brunswick Advertiser/Advertiser and Appeal (1875-1889), Cuthbert Appeal (1866-1886), Sumter Republican (1870-1885), Tifton Gazette (1892-1919), Thomasville Times Enterprise (1873-1922), Valdosta Times (1908-1912), Vienna News (1902-1918), Vienna Progress (1893-1904), Waycross Headlight (1884-1887), Waycross Herald (1892-1914), and Waycross Journal (1901-1914). 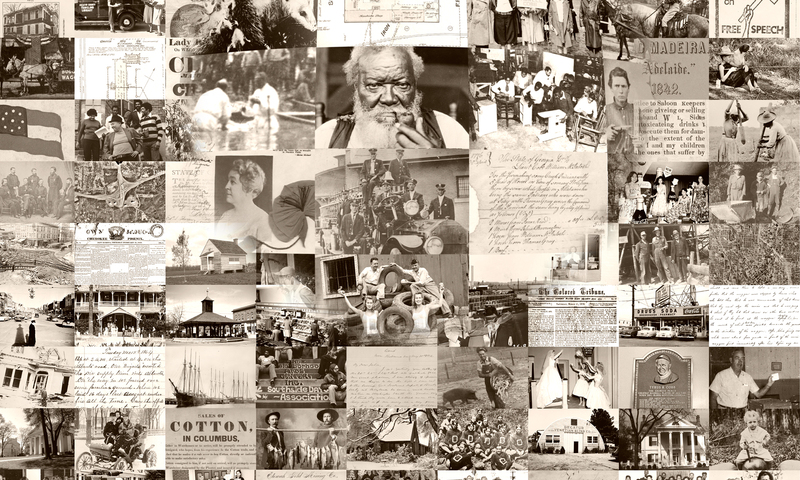 The South Georgia Historic Newspapers Archive is a project of the Digital Library of Georgia, as part of the Georgia HomePLACE initiative. The Digital Library of Georgia is a project of Georgia’s Virtual Library GALILEO and is based at the University of Georgia. Georgia HomePLACE is supported with federal LSTA funds administered by the Institute of Museum and Library Services through the Georgia Public Library Service, a unit of the Board of Regents of the University System of Georgia. 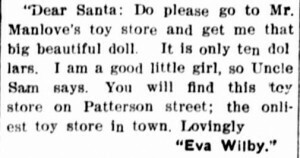 The tradition of children writing letters to Santa Claus rose in popularity in the second half of the nineteenth century in the United States. 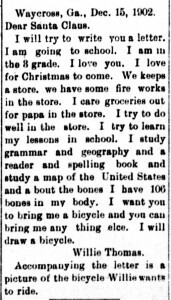 By the early 1900s, newspapers in south Georgia began publishing these letters in their December issues. 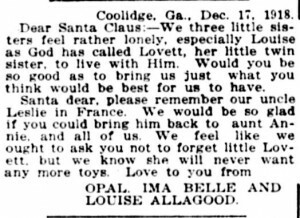 They provide amusing and sometimes poignant insight into Christmas culture, familial relationships, charity, war, and consumerism from a century ago. 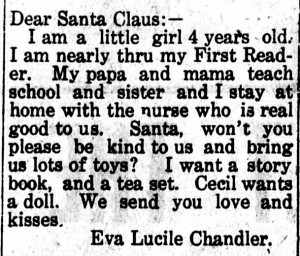 The letters hint at other traditions related to Santa Claus, including his list of good and bad children and the practice of leaving foods for him to eat. 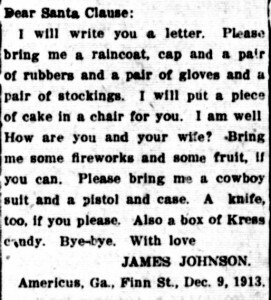 The letters reproduced below and hundreds of others can be found in the South Georgia Historic Newspapers Archive.